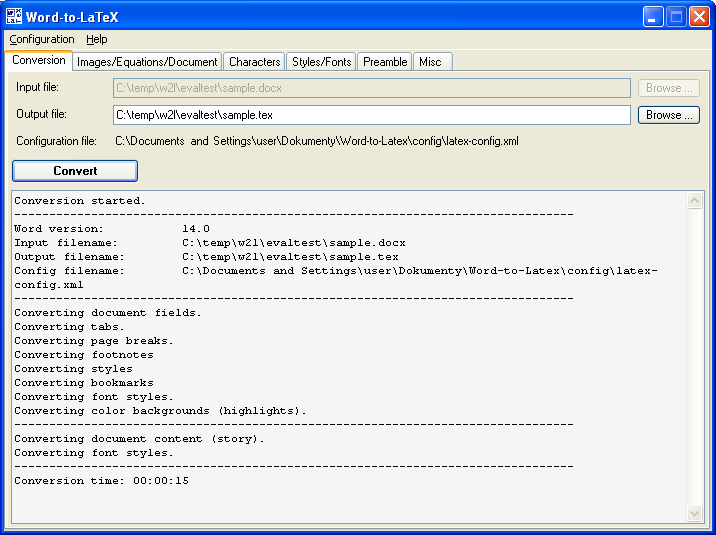 Converts MS Word documents to LaTeX, XML, and other markup languages. The conversion includes equations, tables, figures, lists, various font styles, custom styles, all national and special characters. All conversion mappings can be easily redefined. Converts MS Word documents (DOC, DOCX, RTF) to LaTeX, XML, and other markup languages. The software is fast, accurate, and highly configurable. The conversion includes equations, tables, figures, lists, headings, footnotes, various font styles, custom styles, all national and special characters, and much more. All conversion mappings can be easily redefined (including custom styles and characters). Figures are converted to either EPS or PNG format. Word-to-LaTeX supports all kinds of equarions including MathType, Equation Editor, MS Word 2007-2010 built-in equations. The conversion to XML format is often followed by custom transformations to various formats (e.g., HTML, DocBook) The converter integrates a menu into Microsoft Word where you can set up the conversion for each file you convert. A command-line interface is also provided to allow batch conversion of hundreds of files. Ailt PowerPoint to EMF Converter provides the fast and easy way to convert PPT, PPTX, PPTM format files to EMF in batches. The output EMF quality is super high with preserving the original text, tables, image, layout of your PowerPoint document. This site does not contain serial number, crack, keygen Word-to-LaTeX Converter serial number : serial number is the simplest type of crack. A serial number(cdkey,product key,etc) is register the program as you may already know. a crack or keygen may contain harmful software. If you cannot find the exact version you want, just give it a try. for more information read .nfo/.txt/.diz file include in zipped file.